Cleveland's JaCobi Wood (10) looks for a teammate while being defended by East Hamilton's Cameron Montgomery (2) and Morrell Schramm, right, during their District 5-3A basketball game Tuesday night. Wood scored 31 points and led the Blue Raiders to an impressive 60-40 victory. CLEVELAND, Tenn. – When East Hamilton needed a Darwin Randolph tip-in with less than seven seconds left to beat rival Ooltewah, 52-51, Friday to finish the first half unbeaten (6-0) in District 5-3A, coach Frank Jones said aloud the just-completed game would be an example of how things would be for the Hurricanes on the road in the second half of the season. Tuesday’s key district showdown, pitting state-ranked teams, proved that Cleveland was rougher than tough on the Hurricanes. 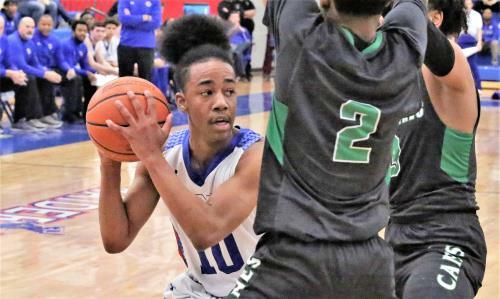 The Blue Raiders (17-4, 5-2), coming off a colossal 72-point dismantling of McMinn County on Friday, cruised past the Hurricanes, 60-40, as JaCobi Wood scored more than half his team’s points and pulled to within one game of East Hamilton for the district lead. Cleveland stretched its winning streak to nine straight games and has scored 242 points its last three outings and, at this moment, looks like the team with the hottest hand heading down the home stretch. The Blue Raiders’ defense shouldn’t be overlooked either. 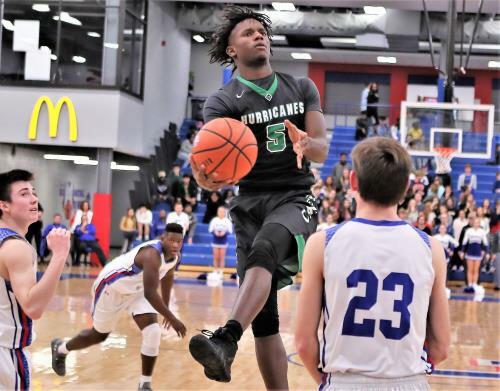 East Hamilton’s top two players through the first half of the season were held to a combined 11 points – seven by Cameron Montgomery and four by Jamaal Walker – and the Hurricanes were held to their fewest points, 13 below the previous low. Cleveland, on the other hand, now has a 15-3 advantage against the Hurricanes (14-4, 6-1) and coach Jason McCowan has his team on cruise control. “I’ve got a lot of confidence in our players right now,” McCowan said. “Coming out of the ‘situation’ we had, you didn’t know what to expect. We built confidence in them and now they’re building confidence in me because we are just playing so well defensively. In the earlier girls’ game, Cleveland (12-11, 6-1) knocked off the Lady Hurricanes, 48-46, on two Joy Douglass free throws with 2.5 seconds remaining. The Lady Canes last led at 12-10 and battled back to tie the game at 44-44 on Anaya Evans’ 3 from the left wing with 2:53 on the clock. East Hamilton had a chance to take the lead following a Cleveland turnover with 48.2 seconds showing, but Eliziah Laboo’s 3-point shot from the right corner was off the mark, leading to Douglass being fouled. Seconds later, Gremore was confronted by Laboo’s father outside the Lady Canes’ dressing room in the Raider Arena. “This isn’t the time for this,” Gremore told his athletic director, Keitha Booker. Within minutes, a security officer, Cleveland’s game administrator and athletic director and East Hamilton principal Brent Eller joined the group and cooled off the verbal altercation. Back to the boys’ game. Wood was a thorn in East Hamilton’s side from the get-go and he gave Princeton, Belmont and Dayton coaches something to ponder when it comes to recruiting. Wood had two of the Raiders’ first three buckets, made three free throws and powered Cleveland to a five-point, first-quarter lead. In the second period, Wood dropped in a layup, drilled a 3 from the right wing and scored on a floater with 3.9 seconds on the clock to give the Raiders a 31-19 halftime advantage. Wood had 14 points at the break. The Hurricanes couldn’t handle Wood at all in the third quarter. The Raiders opened with five straight layups and Wood made three in a row and four in the quick scoring spree. Cleveland was out front, 47-28, going into the fourth quarter. In the final eight minutes, Wood attacked the rim three times for field goals and added three free throws to finish off his brilliant performance. Isaiah Johnson scored 13 points and Grant Hurst added 10 for the Blue Raiders. Sam Randolph led East Hamilton with nine points, all coming in the second half. Morrell Schramm added eight points. After East Hamilton’s took its last lead, Cleveland ran off 11 straight points that included Brenna Droke’s 28-foot 3-pointer at the buzzer to give the Lady Raiders a 15-12 advantage going into the second period. Cleveland’s halftime lead was 30-24. Laboo’s field goal to open the third quarter pulled the Lady Canes to within four points. Kaitlyn Goodman, who had a game-high 14 points with four 3s, and Droke made a 3 and Cleveland had a 36-26 lead. East Hamilton sliced its deficit to four points, but Goodman struck again from long distance. Madison Hayes’ put-back at the buzzer cut the deficit to 39-34 after three quarters. With the game tied at 44-all, Douglass made one of her patented scoop shots. About a minute later, East Hamilton’s Dezah Lacy, one of three Lady Cane starters suspended in a 61-37 loss to Cleveland on Nov. 30, hit a hotly contested driving layup to tie the game again. That set up the final 74 hectic seconds. About that time, Laboo’s father interrupted the Gremore interview with Chattanoogan.com. “Did you call my daughter dumb?” Laboo asked Gremore. Laboo kept pushing the situation, repeating his first question several times, but police and administrators from both schools intervened before it escalated any further. Madison Hayes led East Hamilton with 17 points and Lacy added 16 points, 10 in the second half. East Hamilton (40) – Walker 4, Montgomery 7, Schramm 8, S. Randolph 9, Long 2, Shropshire 4, D. Randolph 6. Cleveland (60) – Dale, Isaiah Johnson 13, Howard 2, JaCobi Wood 31, Grant Hurst 10, Colbaugh, McGowan 2, Stum, Williams 2. 3-Point Goals – East Hamilton 2 (Montgomery 1, S. Randolph 1), Cleveland 4 (Hurst 2, Wood 1, Johnson 1). East Hamilton (46) – Patton, Evans 3, Dezah Lacy 16, Madison Hayes 17, Mc. Hayes, Johnson, Petitt, Sue, Eliziah Laboo 10. Cleveland (48) – Kaitlyn Goodman 14, Person 5, Rominger, Dasher 7, Joy Douglass 12, Droke 8, Anderson 2. 3-Point Goals – East Hamilton 1 (Evans 1), Cleveland 8 (Goodman 4, Droke 2, Dasher 1, Person 1). High-flying Sam Randolph (5) of East Hamilton tries to shoot without drawing a charge on Cleveland's Kley McGowan on Tuesday at the Raider Arena. The Blue Raiders avenged an earlier loss to the Hurricanes with a 60-40 victory.